At a recent show, I was sitting at a dealer’s table sorting through albums of first day covers searching for additions to one of my collecting themes: cachets created by Ken Boll while he was with Cachet Craft. Sitting next to me was a young collector flipping though one of the dealer’s dollar boxes. Pushing the box away from him, the collector asked the dealer if he had a box of real first day covers. Asking what he meant, the collector explained to the dealer that he wanted to see envelopes “that had a drawing or image on the left side and the stamp was cancelled with the official “FIRST DAY OF ISSUE”. Any other envelopes, the collector explained, were not real first day of issue covers. Of course we know that the “drawing” was how the young man described a cachet. Adding first day covers to a collection only if the covers have cachets is certainly a requirement for seasoned collectors as well. No argument there. But the young collector’s characterization of an acceptable cover needing to have the “official” First Day of Issue cancellation prompted me to think about how that rejected potential intriguing and enjoyable sub-themes of first day cover collecting. Most U.S. stamp collectors are familiar with the common (“official”) FIRST DAY OF ISSUE (FDOI) cancellation. 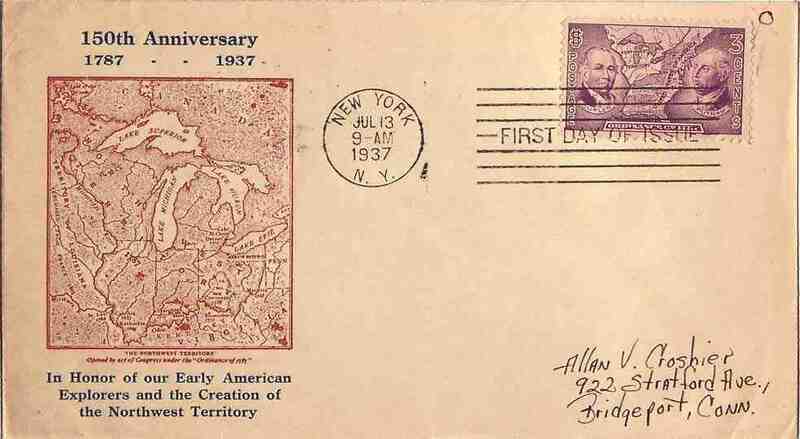 The Post Office used the FDOI machine cancel for the first time on July 13, 1937 for the Northwest Territory Ordinance commemorative issue (Scott 795), Figure 1. Thinking again about the young man’s collecting criteria, it seems that an enjoyable collection theme are covers (with cachets or not) franked with stamps on their first day of issue, but either prior to or after July 13, 1937 and without the “official” FDOI machine cancel. Were such covers philatelically inspired or simply mailings by innocent, non-collectors on the stamp’s first day of issue? As for the philatelically inspired covers, i.e., created by a stamp collector well aware of the first day of issue for the stamp used for the mailing, one such example shown in Figure 2 is franked with the 3-cent General James Oglethorpe issue (Scott 726). 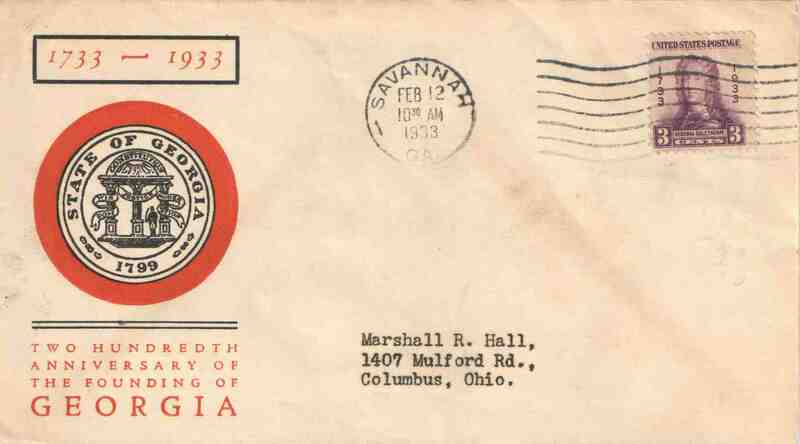 The circular date stamp shows SAVANNAH | GA | FEB 12 | 1933, the first day of issue for the Oglethorpe stamp. Even though the cover has no markings at all related to “first day”, it was unquestionably philatelically inspired in having an attractive e bi-color cachet with the seal of Georgia and underneath the seal, “Two Hundredth Anniversary of the Founding of Georgia”. In my opinion, this non-FDOI first day cover would make an excellent addition to a first day collection, which I have done since Georgia is my home state. A philatelically inspired first day cover. Other examples of philatelically inspired first day covers, but having a less apparent character, are those not having a return address, are franked with excessive postage - such as plate blocks - and have very neatly, typed addresses (the collector’s address) in the lower right or middle portion of the envelope. That is exactly how a collector would construct a cover for his or her first day collection. But such covers have no “first day” markings of any kind and certainly not the “official” FDOI cancellation since the circular date stamp on these covers shows dates prior to July 13, 1937. Again, I consider such covers to be in a special sub-category of first day cover collecting and should not be discounted as unappealing or non-collectible. Scott 790, 732 and 657 franking collector-created first day of issue covers. Of course, there are covers you will encounter not having a cachet or the “official” FDOI cancellation, but created by a collector and marked as First Day of Issue, either hand written, typed or handstamped. Such covers can be another enjoyable first day cover sub-category. But caution should be exercised with such covers as with the one shown in Figure 4. First Day of Issue Cover? 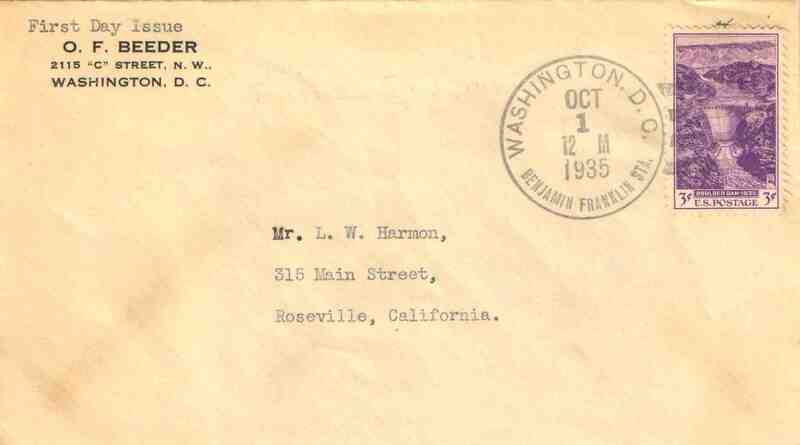 Typed above the return address in the upper left corner is “First Day Issue.” The cover is franked with a 3-cent Boulder Dam commemorative (Scott 774) and has a cds of OCT | 1 | 1935. But the Scott catalogue shows the date of issue for the stamp as September 30th, not October 1. Quite possibly, the collector had all the correct intentions of having the cover processed on September 30th but was delayed for some reason. In any event, the cover is not a first day of issue cover. 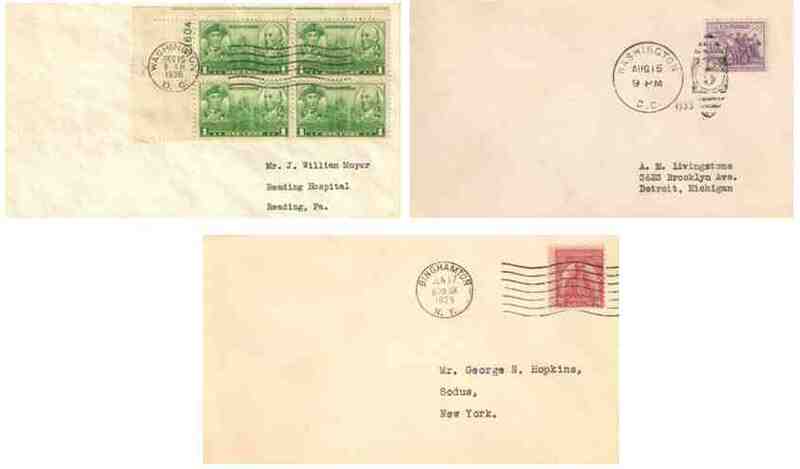 Another sub-theme for covers ranked with stamps on their first day of issue, and after the July 13, 1937 initial use of the FDOI machine cancel, are covers that had a legitimate postal use, that is, mailings that more than likely were sent by non-stamp collectors unaware of the stamp’s first day of issue. Such are the two covers shown in Figure 5. Non-collector created first day of issue covers. Franked with the 3-cent Adoption of the Constitution issue (Scott 798), both covers have a cds of PHILADELPHIA | PA | SEP | 17 | 1938, the first day of issue for the Constitution stamp. The envelope on the left was from Mr. and Mrs. R.G. Lingle of Philadelphia and the cover on the right was from only Mrs. Lingle. Given the size and shape of the envelopes (and, particularly, the marbled character of the paper used for the envelope on the right), both mailings could certainly have contained an invitation to a special event, such as a wedding or a graduation. So, it is reasonable to assume that neither mailing had any underlying philatelic objective of being sent on the first day of issue for the Constitution stamp. The next time you are at a show sitting at a dealer’s table sorting through his first day covers, be mindful of novice collectors looking for “real” first day of issue covers. Consider the opportunity to suggest to the collector the value and enjoyment of several sub-themes of first day cover collecting that don’t require the “official” FIRST DAY OF ISSUE cancellation.